Monster Energy NASCAR Cup Series driver Kyle Busch, known to take little kids’ lunch money in the lower Xfinity Series, started on the pole for Saturday’s race at Michigan International Speedway. He didn’t stay up there for long, as contact with close friend Brad Keselowski sent him straight into the infield grass. The two made contact when Busch moved up the race track to close the door on Keselowski, which didn’t go as he likely intended. 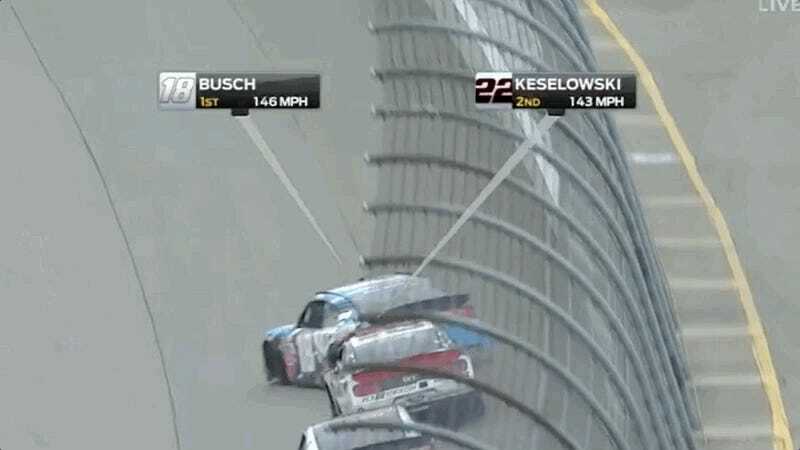 Even though you can hear Keselowski get out of the gas in the second video embedded below, it wasn’t enough to keep from ramming Busch’s back bumper. Busch went down pit road for repairs, starting at the back of the field with ill handling once things got back underway. As expected, he’s working his way back up through the field—quickly. Meanwhile, Keselowski and other Cup Series driver Denny Hamlin took off with the lead and second position, respectively, as the field spread out. They finished the first stage there, while other Cup Series driver Paul Menard crossed the line in fourth. By the end of the first stage, Busch was in 19th. That sure does sound like a lot of Cup Series drivers dominating the Xfinity race—what’s new?—but it could be worse. NASCAR lowered the amount of times that Cup Series drivers can infiltrate its lower series each season in October, which is one of the best rule changes the sanctioning body has made in years. This race is one of each of their 10 allotted Xfinity events for the year. But even with Busch working his way from the back of the pack and the cap on Xfinity starts, we’re not free from the Cup Series drivers leading the way. Oh, well. That’s just how things go.